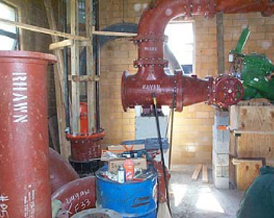 Camden City, Camden County, NJ – CES designed, specified, and provided bidding assistance and construction management for renovations to the North Camden Water Pump Station. This existing 40-year-old water booster station serves a major portion of Camden City and was upgraded to handle a fire flow demand of 2,800 gallons per minute. 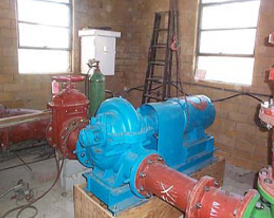 Mechanical improvements included replacement of split case centrifugal pumps. Old valves and pneumatically operated switches were replaced with new solid state electric operators. Additionally, CES professionals upgraded the adjacent five million gallon at-grade storage tank’s cathodic protection system, monitoring system, and the City’s SCADA system. Electrical improvements included retrofitting the entire interior electrical system, including MCC, control panel and telemetering, replacing interior wiring, conduits and grounding, design of a new 480V – 3 phase natural gas standby generator with an automatic transfer switch, and replacement of all interior and exterior lighting.